Special moments in life are meant to be savored - birthdays and anniversaries, job promotions, unique achievements. Now you can help friends and family members celebrate in a bountiful way. 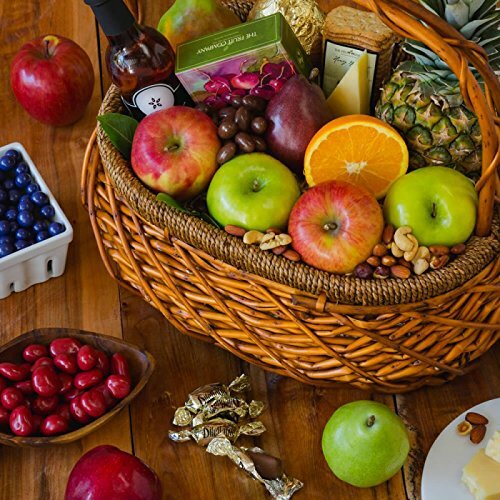 Choose a cornucopia of handpicked delights - gourmet fruit sourced from our own local orchards complimented by gourmet confections, with a cool, tingling apple cider. What a tasteful way to say, "You're the greatest." Citrus cannot be shipped to California or Arizona due to agricultural restrictions. Pineapple cannot be shipped to Hawaii due to agricultural restrictions. Northwest-grown pears or apples will be substituted. For optimal freshness and quality, or due to seasonality, we reserve the right to substitute certain ingredients of equal or higher value.